Thanksgiving is widely celebrated on the fourth Thursday of November in Canada, United States and few Caribbean countries. 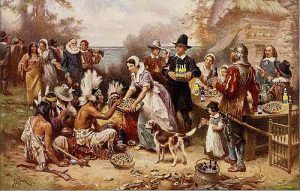 First Thanksgiving was celebrated by the Pilgrims after their first harvest at the Plymouth Plantation in November 1621. It has a very interesting history. In 1620 a small ship called the Mayflower left Plymouth, about 102 people travelled for nearly two months. After a treacherous journey of 66 days, the Pilgrims reached Plymouth, where they began the work of establishing a village at Plymouth. Throughout the first brutal winter, half of the pilgrims died due to extreme cold. However, in the spring of 1621, Squanto, a native Indian taught the pilgrims to survive by growing food. He taught them how to cultivate corn, extract sap from maple trees, catch fish in the rivers and avoid poisonous plants. After the first corn harvest proved successful, Pilgrims organized a celebratory feast and invited a group of Native American and the festival lasted for three days. Pilgrims held their second Thanksgiving celebration in 1623 and days of fasting and thanksgiving on an annual or occasional basis became common. In 1789 George Washington issued the first Thanksgiving proclamation by the national government of the United States. At the same time that year, the Protestant Episcopal Church announced that the first Thursday in November would be set aside yearly for giving thanks. In 1863, during the American Civil War, President Abraham Lincoln proclaimed a national Thanksgiving Day to be held each November and scheduled Thanksgiving for the final Thursday. It has been celebrated nationally since 1789. One of the best things about Thanksgiving is spending time with family. Family reunion and feasting is an important part of Thanksgiving. Roasted turkey, Pumpkin Pies, Corns, Potatoes and Cranberry sauce are primarily the part of the meals on Thanksgiving. It is a chance for families to gather together, to feast and to enjoy being with one another. The entire family sits together at the dinner table and offer prayer to the Lord. It is also a time for relatives and friends living in different places to come together and celebrate and thank God for the wonderful year and pray for a blissful year ahead. Thanksgiving celebration is incomplete without turkey. 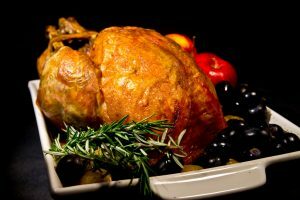 Roasted turkey is a favourite dish on this day. It decorates every dinner table during the feast. About 675 million pounds of turkey is consumed on Thanksgiving Day. Pumpkin pie, mashed potato, cranberry sauce and corns are other traditional foods cocked everywhere to mark the day. Parades have become an integral part of the holiday. This traditional parade first started with President Lincoln when he proclaimed it an official day. It provides entertainment to everyone and displays the military strength of the country. In the present day, parades are organized with musical shows and celebrities also participate in it. 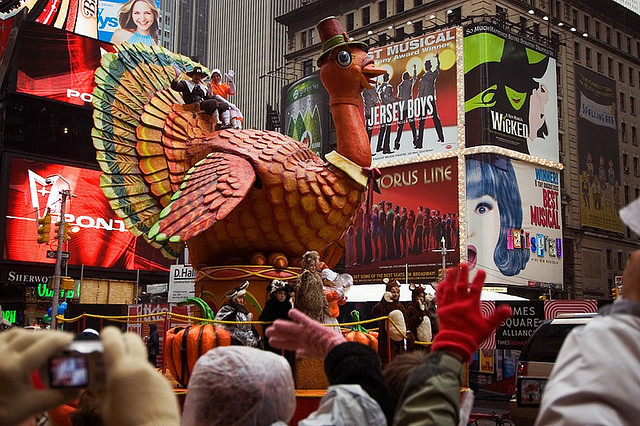 New York City’s Thanksgiving Day parade is the largest and most famous. It features marching bands, performers, and giant balloons shaped like cartoon characters. 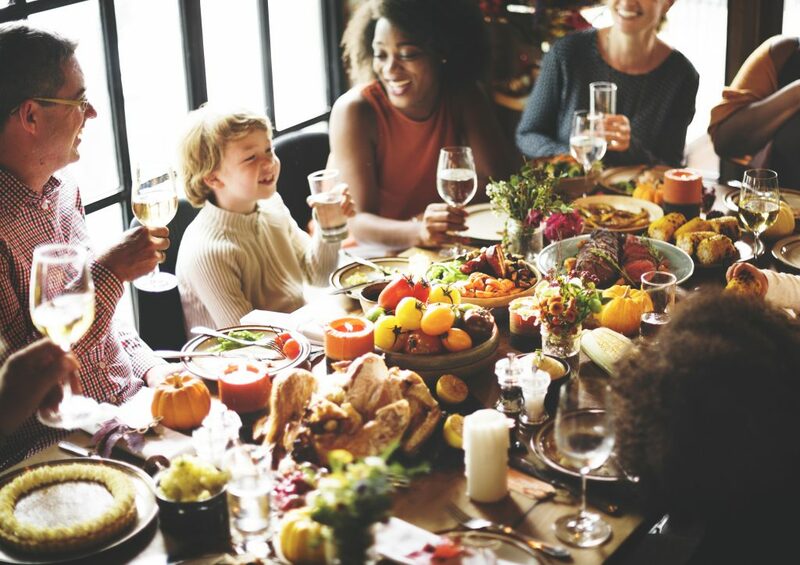 Overall, Thanksgiving is all about Family, Food and Football, It is about spending time with your loved ones, watching football, singing and consuming as much food as you can. It is a time to celebrate with relatives and friends and thank almighty for the wonderful year and pray for a blissful year ahead. 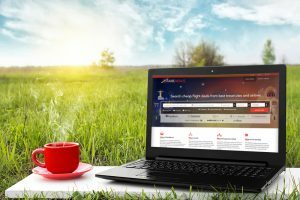 Canadian Festivals - A blend of Emotions and Cultures. Halloween is Back - What's your scary Idea?